Therefore, remember that at one time you Gentiles in the flesh, called “the uncircumcision” by what is called the circumcision, which is made in the flesh by hands – remember that you were at that time separated from Christ, alienated from the commonwealth of Israel and strangers to the covenants of promise, having no hope and without God in the world. But now in Christ Jesus you who once were far off have been brought near by the blood of Christ. For he himself is our peace, who has made us both one and has broken down in his flesh the dividing wall of hostility by abolishing the law of commandments expressed in ordinances, that he might create in himself one new man in place of the two, so making peace, and might reconcile us both to God in one body through the cross, thereby killing the hostility. And he came and preached peace to you who were far off and peace to those who were near. For through him we both have access in one Spirit to the Father. So then you are no longer strangers and aliens, but you are fellow citizens with the saints and members of the household of God, built on the foundation of the apostles and prophets, Christ Jesus himself being the cornerstone, in whom the whole structure, being joined together, grows into a holy temple in the Lord. In him you also are being built together into a dwelling place for God by the Spirit. Grace to you and peace from God our Father and from our Lord and Saviour Jesus Christ! Have you seen the advertisements for the coming “Speak Lord” Bible retreat? Do you remember what it says? A journey through Paul’s most beautiful letter. 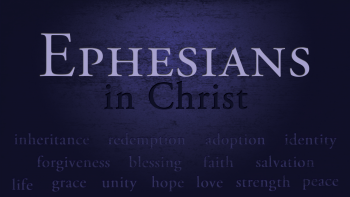 That is – the letter to Ephesians. Sounds a bit cheeky, doesn’t it? Perhaps there could be other candidates to the tittle ‘most beautiful letter’. Anyhow, today we heard a few verses from this letter, and now we can try to get at least a foretaste of what we will be blessed to hear during the retreat. Paul begins his letter to Ephesians with pouring over us such incredible eternal and heavenly Gospel that makes our hearts melt in joy encountering such undeserved and overwhelming grace. Just listen… And when you listen to the Word of God always remember this one thing, – the words that you will hear are addressed also to you. That’s right. To you. It is the Holy Spirit speaking to you God’s love and comforting you with His promises. It is Jesus voice embracing you. Listen! “Blessed be the God and Father of our Lord Jesus Christ, who has blessed us in Christ with every spiritual blessing in the heavenly places.” You are blessed with every spiritual blessing in the heavenly places. “Even as he chose us in him before the foundation of the world, that we should be holy and blameless before him.” Think about this, – the Father has chosen you in Jesus before the foundation of the world. “In love he predestined us for adoption as sons through Jesus Christ, according to the purpose of his will.” In His love towards you your Father in heaven predestined you for adoption in His family. You are His child. “In him (in Jesus) we have redemption through his blood, the forgiveness of our trespasses, according to the riches of his grace.” In Jesus you have redemption. He has bought you out of slavery to sin and death, not by gold or silver, but by His holy and precious blood, and His innocent sufferings and death. You are free. “In him (in Jesus) we have obtained an inheritance.” In Jesus you have obtained an inheritance. An inheritance with Jesus in the New Heavens and New Earth. It is already yours. As you listen to the Gospel of God’s unconditional love, you are sealed with the Holy Spirit. And the presence of the Holy Spirit with you is God’s own guarantee to you, that you will acquire your inheritance with all the saints, to the praise of our Father. There is so much in these first verses of this beautiful letter. So much… And remember, it is the Triune God speaking to you. Not to some general audience, but personally to you, as His chosen and beloved child. What a great privilege it is, and how keen should we be to sit at the feet of our great Master Jesus and take in what He wants us to hear. All these beautiful blessings that Paul describes are hard even to imagine. The question comes to mind, – why is the Triune God the Father, Son and Holy Spirit so gracious and generous to us?! The answer is, – this has nothing to do with us, it simply reveals what kind of God our God is. God gracious and merciful, slow to anger and abundant in steadfast love, showing His love to the thousands generation to those who love Him and keep His commandments. And the same wonderful message of God’s love and grace given to everyone in Jesus permeates the whole letter to Ephesians. The verses from Chapter 2 which we heard earlier help us to continue to reflect on how much is given to us. In such circumstances there is this risk that we may forget or at least struggle to appreciate what is given to us. We just may take it for granted. What a big deal, to be a Christian! That’s why what Paul writes is so helpful. In his letter Paul compares, on one hand, what it means to be a Christian, and on the other, what it means to be without Jesus, without the Father, what it means to live in this world if you are not a Christian. Let’s reflect at least on a few of comparisons that Paul makes. “You who once were far off have been brought near by the blood of Christ”. We all are born sinful and unclean, as we say in our confession. This sad description is true for every human being born in this world. We are born without the knowledge of God. Yes, we have built into us the knowledge that there is something higher, but we don’t know what, of who He is, or what kind of person He is, or what His attitude towards us is. Even more, we are born hostile towards God. For we want to be like gods ourselves. To do everything our way. And by our own power we can’t change that. This is where all people are without God. But now, the Triune God Himself has acted in your life. He has brought you near to Himself by the blood of Christ. It was a very costly action. The Son of God became one of us and voluntarily lied down His live, in exchange to ours. He received death, so that we can receive eternal life. Now it is yours. Paul continues: “You were in the flesh, but now you are in the Spirit.” “In the flesh” is the very opposite to being “in the Spirit”, or we could rephrase, – you were without the Spirit and now you have the Spirit of God. Remember, we have spoken often about this. 2KR. Remember what it means? That we as human creatures are created for two kinds of relationships. For vertical relationships with your Creator, and for horizontal relationships with other human creature and the creation in the broadest sense. Having these two, living in these two is what makes us fully human. When people are in the flesh only, they are less than human. They lack the most important relationships, those in which we receive the most important things in our life, our identity, meaning, significance, etc. The truth is that no one can establish these vertical relationships on their own. Unless the Triune God first invites us. Now, in your life He has done it. He has spoken to you in His Word and by speaking He has sent to you His Spirit. You are not in the flesh anymore. You have been made fully human. God the Father has given you His Spirit, the Spirit of life, and joy and truth to dwell in you. And it is the work of the Spirit, that you have these relationships with the Father and with Jesus Christ. The Spirit has made you good again, very good. Next: “You were separated from Jesus Christ, but now in him you also are being built together into a dwelling place for God by the Spirit.” Being separated from Jesus is much more that simply not knowing about Him. We are not united with or separated from Jesus by the virtue of knowing about Him. We can be united with Him only by means of the Holy Spirit. Where does that happen? You know the answer. Where the Gospel is preached, and the Sacraments administered. In other words, in the Church. Being united with Jesus means that the Spirit has made you a member for God’s Church. That you are united by means of the Holy Spirit both with the Triune God and all with all His saints. It means that you are built together with other God’s saints into a dwelling place for God. In the Old Testament time God Yahweh appointed the Temple in Jerusalem as His dwelling place. Today the Church is His temple. The body of Christ is His Temple. You are His temple. The Holy Spirit has united you with Jesus, and this is much deeper union than we can possibly understand. This is the union that through death and resurrection will bring us into God’s eternal Kingdom, this is the union that will last forever. The last one: “You had no hope and were without God, but now you have access in one Spirit to the Father.” That’s right, it is very simple, – no God, no hope. Some may argue that it is not true. That there are many things to hope for. Sure, but they all belong to this world. And as we know it well, in this world, there is nothing permanent. Things change. Often too rapidly. Something good happens, how long can you enjoy it? How long even your joy will last? We live in the world where even our best experiences are tainted by sin. And the longer we live the clearer it gets, that we are not going to build Paradise here, in this age. It’s not going to happen. There is no hope for that. It is very hard to live without hope. That’s why people attach their hopes to things of this world. Career. Possession. Achievements. Fame. People. And then we may invest our time and energy and talents trying to get what we hope will give us what we long for. And when you get there… the harsh reality hits in, it is not there. What we were hoping for is not there. No true God, no hope. And how different it is when you know the Triune God as your God. He has made you and still preserves you. He provides for your daily needs. He has redeemed you, so that you … may be His own, and would live with Him in everlasting joy and blessedness. He is the Creator, He is all-powerful. He has promised to purify His creation from sin, from evil, from pain, from injustice, from death. He has promised to bring forth New Heavens and New Earth where peace and justice reigns. He has promised that every one of His children, everyone who listens to Him, who has received His Spirit, will be there with Him. This is our hope, our Christian hope, and this hope won’t put us to shame. Having this hope doesn’t necessary change our situation here. We still have the same struggles that all human beings have. But it makes a huge difference, knowing what awaits us. Do you remember the words of Paul? “For I consider that the sufferings of this present time are not worth comparing with the glory that is to be revealed to us.” This is what the world doesn’t have, and what you have. Eternal hope and sure promises of our faithful God. There are so much more beautiful and comforting words in Pauls letter to Ephesians. However, I pray that even these brief reflections would help us to appreciate and remember what an incredible blessing it is, – to be called children of God, and this is who you are. And may the same Spirit help us to appreciate all the gifts of God and to be grateful. May the joy of being God’s chosen and beloved children motivates us to do us as much as we can so that those who are still far from God, can have what we have as well.